Cape Sharp Tidal Inc. successfully retrieved its 1,000 tonne, OpenHydro tidal turbine today from the FORCE test site at Black Rock west of Parrsboro. She confirmed that earlier this week, divers managed to free the turbine from a mooring line that had become entangled in its base in mid-April when the company first tried to retrieve it. 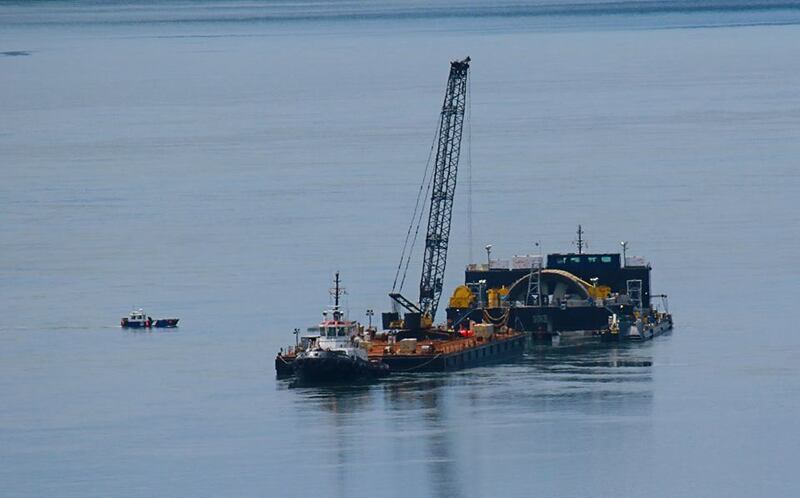 She added that the turbine has been moved to nearby West Bay where it will be inspected, then prepared for transport to St. Marys Bay near Digby for underwater testing within the recovery frame of the Scotia Tide barge. It’s not clear whether Cape Sharp has obtained approval from the provincial environment department for testing in a location other than its FORCE site. Pineau says the turbine will eventually be moved to the harbour at Saint John, N.B. where it will undergo repairs to the electrical components in its Turbine Control Centre. The company has previously said that it intends to deploy its second turbine at the FORCE site sometime this year. That turbine is now in Saint John. UPDATE: Cape Sharp later cancelled its plans for further testing near Digby and moved the turbine directly to Saint John. It now says that after repairs and upgrades, the turbine will be re-deployed to the FORCE site and that a second turbine, now being stored at Saint John, will also be deployed this year. This entry was posted in Tidal Power and tagged Cape Sharp Tidal Inc., Scotia Tide, Stacey Pineau. Bookmark the permalink.